How Rohitha Rajapaksa Proposed To Tatyana Jayaratne On the Top of Mt.Kilimanjaro in Tanzania and Married Her by the side of a Pond at Weeraketiya in Sri Lanka. Standing atop the iconic Mount Kilimanjaro in Tanzania, he proposed to her. The three dormant volcanoes, after which the mountain is named, did not erupt but his love for her had peaked. With a smile, she accepted. From the highest mountain in Africa (4900 feet), the romance transcended further to the hinterland of Beliatte in southern Sri Lanka. 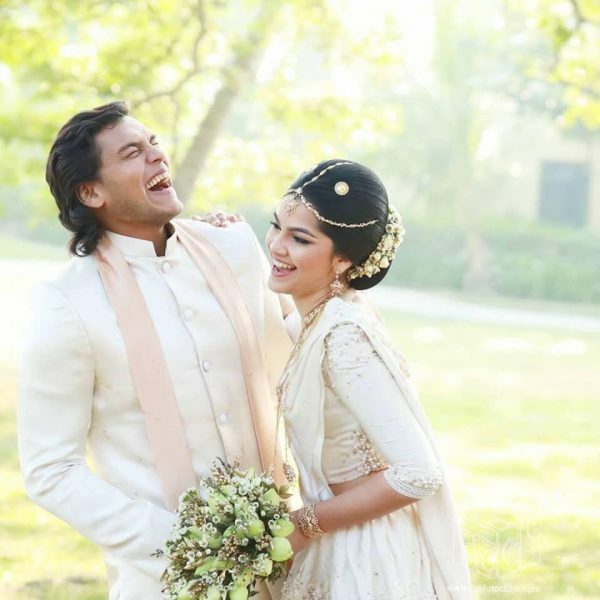 At his ancestral home in Medamulana, Rohitha Rajapaksa married his long time sweetheart,Tatyana Jayaratne, on Thursday morning. The third son of former President and now Opposition Leader, Mahinda Rajapaksa, Rohitha the space enthusiast, rose to newer heights. The wedding ceremony, which was attended by everybody who is somebody in Sri Lanka and the people of the area, had an estimated guest count of well over 5,000 — easily the largest in the past many decades. Father Rajapaksa had invited a member of every household from the village. An emissary of his went from house to house to invite them. Forming the backdrop for the grand event, which many guests said was traditional and simple, was the Medamulana Walawwa and its sprawling lands. A pokuna (large pond) jutted into a small land area. Here, a wooden platform adorned with flowers formed the poruwa, where the traditional Sinhala wedding ceremony and rituals took place. A stretch of water beyond lay a small island. Under the shade of a Mara tree which spread out like an umbrella, damsels in pink provided a colourful setting. They danced. Pink is in fact the colour chosen by Mahinda Rajapaksa for Sri Lanka Podujana Party (SLPP) of which he is the de facto leader. The bride’s-maids and the bride groom’s mother, Shiranthi, were in matching pink. Just past 9 am, bride Tatyana arrived in a tirukkeley (a bullock cart used yesteryear, but now only used for traditional racing, usually in the south). Its cogwheels were decorated with white flowers. The front of the roof also bore the same floral decor. A group of young girls sang Jayamangala gathas as Rohitha and Tatyana exchanged rings. Amidst Magul bera, the Kandyan dancers gyrated. The sounds of the drumbeat wafted in the hot morning air as the couple took a seat together. Guests lined up to congratulate them. There were two large, well decorated canopies. Inside one was vegetarian food, all Sinhala preparations by two different caterers. They included Brinjal Pahi, Ala Thel Daala, Parippu, Polos, Kesel Muwa, Kos, Dhel, Cadju and different varieties of rice. Fresh fruit juices, including Dragon Fruit juice, from fruits grown in the garden, and thambili water were served. Dessert was Sago Pudding (Sou), Ice Cream, and Curd with Treacle, the trademark of the deep south. There were cadjan thatched juice bars. Kavun, Kokis and other local sweetmeats were placed there in large cane baskets for anyone to help themselves. These were also served by men in sarongs and white T-shirts. Besides diplomats, among the VIPs present in a show of camaraderie were Prime Minister Ranil Wickremesinghe, Ministers Mangala Samaraweera, Sagala Ratnayake, Ravi Karunanayake, Kabir Hashim and Ranjith Madduma Bandara. So were almost all ‘Joint Opposition’ MPs including the ‘JO’ Parliamentary Group leader Dinesh Gunawardena. A notable absentee was Sajith Premadasa, Hambantota District MP and deputy leader of the UNP. Gotabaya Rajapaksa, former Defence Secretary, apparenly found the heat a bit too much and chose to remove his tie. This was in marked contrast to one of his earlier military commanders who wore a thick woollen coat, used in winter in the west and went through the ceremonies. Brother Basil Rajapaksa arrived a little late, after being the attesting witness at a wedding in Colombo that morning. There was a separate enclosure for the drivers bringing in the guests. That included buffet tables where all the same dishes were on display. They drove through one entrance and exited through another from a land area inside ‘Carlton House’. A church ceremony for the couple takes place in Colombo tomorrow(28). « Sri Lanka Freedom Party Unanimously Resolves To Nominate Maithripala Sirisena as the Party Candidate at the Forthcoming Presidential Elections.